Old Navy: 35% Off Online! You are here: Home / Great Deals / Old Navy: 35% Off Online! Starting 1/12/14 get 35% off at Old Navy, Gap, or Banana Republic online! 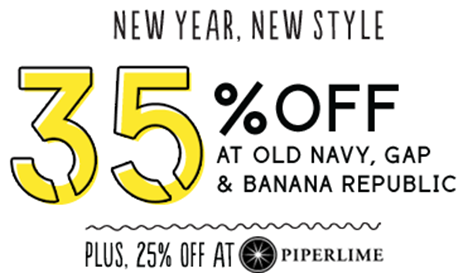 PLUS, 25% off at Piperlime! Just use code: NEWSTYLE at checkout to get yours! PLUS, through today (1/12/14) you can get $10 Super Cash for every $50 you spend! Clearance prices start as low as $2.97! Get 35% off Banana Republic , Gap, and Old Navy + 25% off Piperlime merchandise: Offer valid on Banana Republic, Gap, Old Navy, and Piperlime merchandise purchased online only from 1/12/2014 at 12:00 AM ET through 1/13/2014 at 11:59 PM ET in the U.S. (including Puerto Rico) only. Offer not valid on international shipments. Offer not valid at Gap stores, Banana Republic stores, Old Navy stores, Athleta stores, Piperlime stores, Banana Republic Factory Store or Gap Outlet. Not valid on the following Banana Republic merchandise: BR Picks, Men’s Performance Collection, 100% Cashmere, men’s suit jackets, men’s and women’s blazers, leather apparel and designer collections & collaborations. Discount applies to Gap branded products ONLY, excludes products that are not solely Gap branded products. Not combinable with other offers or discounts except for GapCash, Reward Cards, 10% Gap Tuesday, 10% GapCard Shopping Pass and the initial acquisition discount when approved for a new GapCard. Discount taken off of single unit ticket price. Discount taken at register. Not valid on the following Gap merchandise: First Favorites, babyGap ❤ collection, Paddington Bear™, Junk Food™, Star Wars™, Tailgate®, Threadless®, Minnetonka™, NuBra® and GQ. Offer not valid on the following Old Navy merchandise: Old Navy Everyday Steals, Active by Old Navy and Clearance. Offer valid for redemption on select Piperlime merchandise online. Offer not valid on international purchases and in the Piperlime store in New York, NY. Offer not valid on the following select brands: Bailey 44, Clare Vivier, Current Elliott, Ella Moss, Equipment, Frye, Haute Hippie, Hunter, Joie, Loeffler Randall, Marc by Marc Jacobs, Milly, Minnetonka, Nixon, Rag & Bone, Rebecca Minkoff, Soft Joie, Splendid, Stuart Weitzman, Theory, Tracy Reese, and Vince. Offer not valid on the following items: Piperlime OMGiftboxes, Steve Madden “Troopa”, Sam Edelman “Petty”, “Penny”. Offer not valid on the following Piperlime categories: Sunglasses. Discount applies to merchandise only, not to Giftcards purchased, packaging, applicable taxes, shipping and handling charges. In-store prices may vary and may differ from online prices. Online promotional codes cannot be used on in-store purchases. Offer is good for multiple uses online. Must enter promo code at checkout to receive discount. No adjustments on previous purchases. Not valid for cash or cash equivalent. Offer cannot be combined with Gap Inc. employee discount or any other offers or discounts. Not responsible for lost or stolen coupons.